This is my first year using a Hobinich planner. I wanted a more traditional, visual calendar set up to assist my planning in addition to my daily Bullet Journal. I could set up spreads in my bujo to do this, but I didn’t think that would be a good use of my time, and well, Hobinichi use Tomoe River paper..... One of my justifications for purchasing the Hobinichi was the beautiful leather covers I had spied on an excursion to Galen Leather’s website. I ordered the Hobonich from Wonderpens a few months ago and then promptly ordered the Techo Weeks leather cover from Galen Leather. I chose Galen Leather’s Hobinichi Weeks cover in crazy horse brown. As usually, ordering from Galen Leather’s website was easy and painless and I appreciated that I can shop in my local currency (Canadian dollars) and I didn’t have to make the usual US / Can conversion calculations in my head. Although ordering and payment were quick, Galen Leather does not inventory much product and makes most of it to order. As a previous customer, I was not surprised by this and was given about a two-week lead time before shipping. Galen beat by several days and ships by expedited shipping, so delivery was only a couple of weeks after ordering. Communication is strong and clear, even though Galen is based in Turkey and I only speak English. Also, desite the expensive charges, Fed Ex’s tracking system was terrible and completely inaccurate. Be forewarned. I genuinely like the leather of this case. The leather is soft and has a beautiful patina that I expect to develop further with age and handling. The build quality is very nicely done - the stitching is perfect on my example. The cover construction seems to have reinforced front and rear sections to stiffen them and protect the contents. The full zipper extends to all four sides allowing the cover to sit flat when laid flat, which is perfect for writing in. A stitched leather zipper pull shows the level of detail that Galen puts into their products. The front is flat, and the back has a field notes sized pocket on the outside, about halfway up. The interior of the case is fully trimmed and detailed with leather. The rear inside cover has a flap to slide and hold the back of the planner and a small, letter-shaped pocket vertically behind it. The interior also contains a pen loop along the inside of the spine, which is nicely out of the way of the planner when closed. An excellent detail is that the edge of the leather pen loop has an elastic material insert, which you can’t see in the open case, but which allows for a wide variety of pens to securely fit into the loop. I chose to put a Pilot Custom 74 with an EF nib into the slot, as I wanted a small nib to keep my handwriting small in the smaller Hobonichi planner and also to allow the ink to dry quickly on the coated Tomoe River paper. The inside front cover of the Leather Case is a wallet replacement design, with slots for identification and several slots for credit/debit cards as well as a vertical money / receipt pouch behind the credit card slots. This layout is not particularly useful for me, but I knew what it was before ordering. The final slot is deep enough for a pocket notebook, and I carry a spare Field Notes there. I carry a separate wallet in my pants pocket and this cover set up is too large for daily use for me. I am hoping to come up with a good idea of what to put into the slots as the case still seems empty with all of the open slots. Regardless of how I can make the functionality work optimally for me, the manufacturing quality of this cover is exceptional. However, in order to see how good this cover is, I must also touch on the planner and pen. I purchased a Games-themed Hobonichi Techo Weeks for this year from Wonderpens in Toronto. This was my first Hobonichi, and I have heard many good things amongst fountain pen users because of the high-quality Tomoe River paper. The Hobonichi came with a harder cardboard cover than I had expected. The cover is a glossy photograph of a games table, and included inserts for a cute find-the-item game in the cover photo (as well as less useful train maps of Japan). This layout included English subtitles and dates (and I understand there is a full Japanese version available as well). The only page of information that makes any sense to me is the page that shows a graphic listing the ability to write down your common hand measurements for future reference. Something I have never thought about doing before. The Hobonichi uses Tomoe River paper, which, aside from being very fountain pen friendly, is also very thin. This results in a surprisingly thin notebook. As expected, the thin TR paper does sheen beautifully. Unfortunately, the paper does give the ink a longer dry time than other paper, which may present smudging problems for lefties or for quick notes with a thick nib. I chose to use a very fine nibbed fountain pen to avoid these problems. It does seem like a waste of the wonderful ink properties that can be shown on this fantastic paper but this nib works well in my rapid note taking use. At 7 3/8” tall and 3 5/8” wide, the book is reasonably compact. However, the Galen Case does add about an inch at the top and bottom and about a 1/2 inch at each side. The case is ideal for a bag or backpack, but a little too big for pocket carry (even with cargo pants). I am using this planner for monthly and weekly schedule tracking and family commitments, and it is working well. I still use an A5 Leuchtturm notebook for my full bullet journal notes, but I find that the Future Log spread I use is not detailed and visual enough for my quick needs,. The perfect pen for this set up for me is my Pilot Custom 74 with an extra-fine 14k gold nib. This cartridge/converter pen writes beautifully and provides a nice, small line that dries very quickly. An added bonus is that it fits perfectly in the cover’s pen loop. As a medium sized pen, the cover also protects it from damage. A full review of the pen is outside the scope and length of this article; however, the Japanese nib is very fine, but smooth, and the pen with an inner cap stays wet during extended storage times. It has a classic fountain pen appearance, and is supplied with a converter to allow your choice of ink. I chose a Robert Oster blue ink for use in this journal. 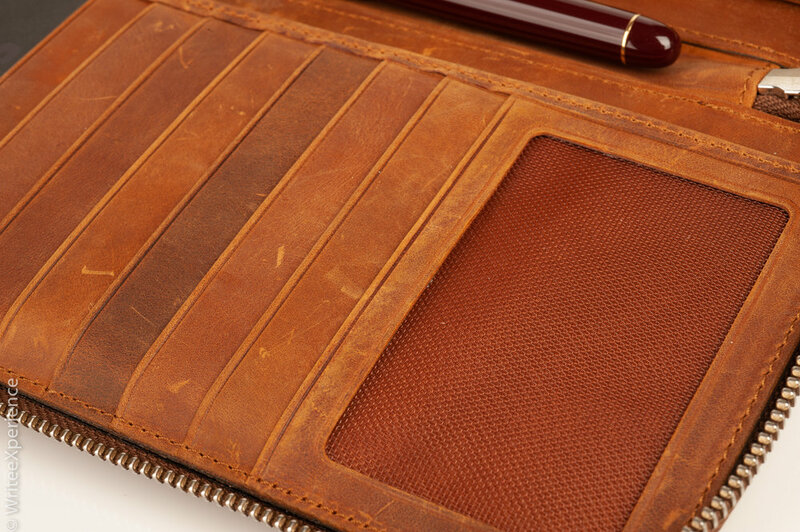 The Galen Leather Hobonichi Weeks cover is a beautiful and well-crafted leather cover. While it adds size to the Hobonichi Weeks book, it is perfect for daily carry in a backpack or bag, but too big for pocket carry. While the wallet card inserts may have limited use depending on your needs, this is an excellent cover to protect your Hobonich Weeks as well as carrying a nice fountain pen for easy access. If you are looking for a month and week-at-a-glance planner to work with your fountain pens, this is a good choice. Long term use will allow a better perspective, but it is a lovely piece of stationery.